Most adventure games whisk you through gorgeous, fantastical worlds full of dashing heroes and heroines. Not Bad Mojo. Pulse Entertainment’s 1996 adventure turns that notion on its beady, antennaed head, starring an ugly little cockroach that takes you for (hopefully) the most disgusting ride of your life. In this terrifically unique game, you “play” as Roger Samms, a weirdo with a bowl haircut living in a dingy little apartment above a dive bar. He seems to have stumbled across quite a bit of money and is ready to start the good life and get out of dodge. Only before doing so, he tries to pack up his mother's strange locket, and all of a sudden he's zapped into a cockroach. Yuck! Not a Kafka-esque, man-sized bug, either. You’re the real deal, and now even normal household elements are life-and-death struggles for survival – especially with no hands! The arrow keys are used to maneuver poor roach Roger through different hazards like roach motels and hot stove burners to get to the bottom of what happened to him. It takes some getting used to, but you’ll soon be immersed in a world filled with hot bubbling dangers just waiting to extinguish you. You won’t gather inventory or solve traditional puzzles; rather, you’ll have to carefully determine how to make it across each dangerous landscape unscathed. But be forewarned: your skin may not stop crawling as you watch yourself skitter past dead rats and across a leftover TV dinner. Bad Mojo is definitely not for the squeamish, but if you can stomach the grotesqueries, exploring this suddenly imposing everyday world and solving puzzles is utterly fascinating from a roach’s point of view. 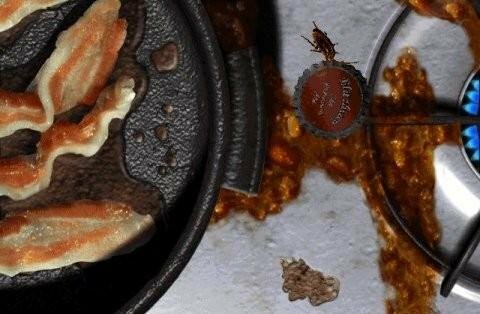 Whether playing the original or the “Redux” version with updated video, you may not emerge from Bad Mojo with a newfound love of roaches, but the next time you see one, you may just have some grudging respect for its perilous adventure, having lived through a memorable one yourself. Capcom’s quirky Phoenix Wright: Ace Attorney took the adventure community by storm when it was released in 2005. 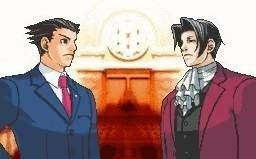 Originally launched in Japan on the Game Boy Advance, the enhanced remake for the Nintendo DS introduced the endearingly nervous, spiky-haired defense attorney and made common household expressions out of his patented catch-phrases “Hold It!” and “Take That!” The rookie’s five cases involve investigating crime scenes personally before defending the accused against seemingly impossible odds in court against the brilliantly flamboyant prosecutor Miles Edgeworth. But real-world laws do not apply in a courtroom ruled by a clueless, gavel-happy judge, with compulsively lying witnesses allowed to change their testimonies at will. It’s all very strange, surreal, and utterly charming, with a brilliant new gameplay dynamic as well. The investigative portions involve examining locations for clues and interviewing people to acquire evidence you can take to court. There it must be presented at just the right moment to support your theories or catch a witness fibbing. These court scenes essentially become complex dialogue puzzles as you sift through testimonies line by line, looking for weaknesses. You can press for more, call them on a suspected lie, or let the statement slide. But be careful! Mistakes have consequences – make enough and you can be sure a guilty verdict will come down. The backdrop to all this bizarre action is a delightful anime-style graphical presentation, with wonderfully exaggerated character gestures and expressions. The final case, exclusive to the DS remake, even makes clever use of the handheld’s unique features, which none of its sequels have matched. With its strong script, oddball characters and creative gameplay, Phoenix Wright: Ace Attorney can stake a claim as one of the genre’s best on any platform. Surely there is no objection. 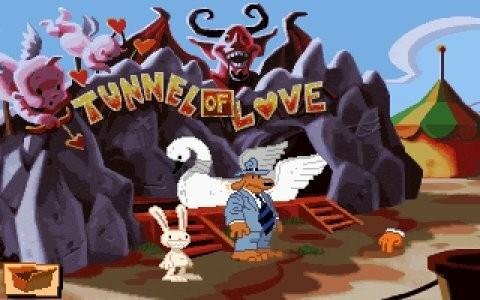 The world is a better place with Sam & Max in it. In this politically correct era of Disney ideals, we NEED a canine shamus and a hyperkinetic rabbity thing who don’t think twice about gutting a cat just to move the investigation on (in a totally comedic way, of course). The Freelance Police may have been internally assimilated in the company’s early days (starting life as test sprites for the SCUMM engine), but LucasArts took a big gamble in giving cartoonist Steve Purcell’s creations a full game all their own – quaint family hijinx these were not. It was a risk that paid off brilliantly, however, as the outcome was an amusingly surreal road adventure across the tourist back alleys of the US of A. Released in 1993, the game looked similar to other titles of the time, but the humour was an entirely different beast. Purcell based the story on some of his early Sam & Max comics, fully expecting them to get toned down during production. Not so, thankfully, as Hit the Road is hilariously edgy from beginning to end. Complementing the excellent jazz-inspired score is some brilliantly bizarre dialogue brought to life by inspired voice acting. Rounding it all off was a big overhaul for the SCUMM engine, replacing the standard verb input method with a set of icons selectable by right-clicking – a feature still used in some adventures today. All these factors combined to make Sam & Max Hit the Road a riot, which is exactly how they’d like it. The pair have remained immensely popular over the years, with multiple sequels and even a cartoon television series, but for most of us, this is where it all began and it’s proven very hard to top. After two successful comic adventures based on Terry Prachett’s fantasy Discworld franchise, Perfect 10 Productions took the series in an unusual direction, with even better results. Discworld Noir is what you’d get if you mix a parody of classic film noir elements and a sprinkle of pure dark whimsy, set on this bizarre flat disc on the back of four elephants, who in turn ride on the back of a giant cosmic turtle. The Discworld’s first-ever detective is the hard-boiled, down-on-his-luck Lewton, whose life takes a turn for the crazy when he encounters the mysterious, seductive Carlotta Von Uberwald. As you help Lewton investigate an increasingly complex case, you’ll get to interact with some old Discworld favorites like Nobby, a corporal on the city watch who never gave up his old habit of stealing things when no one was looking, and new characters created specifically for this game, like Al Khali, a murderous dwarf who eschews the typical fine-toothed comb for an axe when searching Lewton’s office. 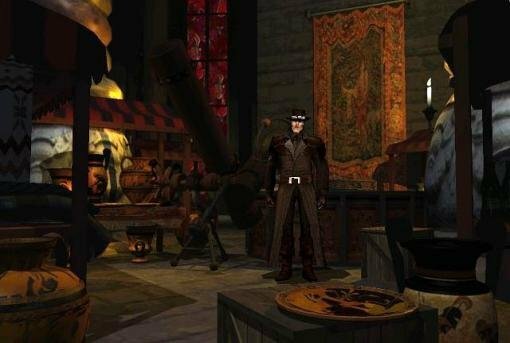 Surrounding these oddball characters are fantastic pre-rendered backgrounds that capture the dark, dreary city of Ankh-Morpork perfectly. You’ll explore the city’s seedy underbelly (well, as the Discworld’s largest city, it’s all seedy underbelly, so that’s a lot of exploring) for clues, which is another of the game’s strong points. Your tasks focus on detective work rather than typical inventory puzzles (though there are a few of those), and it’s a blast interviewing suspects, exploring a variety of locations, and gathering information. The game provides you with a handy notebook that doesn’t just keep track of clues, it lets you actually use them much like regular inventory. It's a common feature in adventures today, but this game was blazing that trail long before others caught on. Working as a private eye focused on gathering and manipulating clues to come to a solution is a perfect integration of gameplay and story. Whether you like detective stories, film noir, comedic fantasy, incessant rain, or blackmailing singing trolls, you can’t help but enjoy investigating the zany universe of Discworld Noir. It all started with a tech demo, showing a teary-eyed woman berating the player with accusations of infidelity and abuse. Quantic Dream showed they had come nearer to leapfrogging the Uncanny Valley as anyone could have imagined in 2005. Four years later, it came to fruition in Heavy Rain, an innovative, experimental adventure game on a console dominated by shooters and RPGs. Building on the work begun in Indigo Prophecy/Fahrenheit, the French developer pushed the envelope in visual fidelity, cinematic presentation, and branching story paths where the player’s actions truly matter. Freedom of choice is hardly a new concept, but rarely (if ever) has it been pushed to these extremes with such impressive results. Heavy Rain even managed the unthinkable: it made Quick Time Events fun. Now that is an accomplishment. There are four storylines in Heavy Rain, each involving a different main character, including a father grieving over the loss of one son and driven to action by the kidnapping of another, an FBI profiler with sci-fi sunglasses to analyze clues at crime scenes, a private eye, and an investigative journalist, all pursuing individual leads into the identity of the serial Origami Killer. Rarely do the characters interact with each other, but their narratives cleverly interlock to provide an intriguing whole. Each protagonist is given real depth of character that allows you to identify with them, making you all the more invested in their fates. Their stories all depend heavily on the player's choices, successes, and failures, and results can vary wildly, making one playthrough truly unique from another. If one of them dies, the story even plows forward without them. 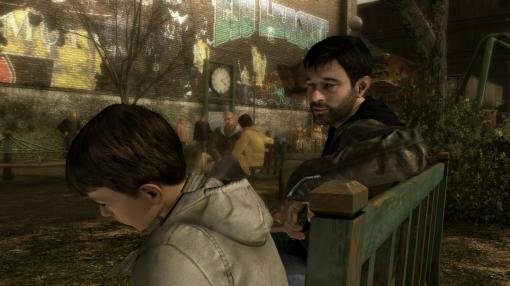 At times it feels more like a movie than game, but when it comes to taut, emotionally-charged, player-directed thrillers, Heavy Rain is better than perhaps any game ever made.